Veg Grilled Sandwich Recipes, Collection of Grilled Sandwiches. Grilled sandwiches are nothing but toasted sandwiches made using a griller. They can be as simple as a cheese grilled sandwich or a sumptous veg grilled sandwiches. The stuffing of grilled sandwiches will vary from a combination of cheeses to myraid of vegetables like potatoes, onions, cucumbers, tomatoes. The Mumbai grilled sandwich is a combination of spicy chutney, crunchy vegetables and generous amounts of cheese and butter grilled to perfection. The most famous street food sandwich is vegetable grilled sandwich recipe made with a large assortment of vegetables, oodles of butter, a lavish splash of chutneys and a peppy sandwich masala, this snack is indeed an indulgence. You can see a big crowd late at night on Mumbai's posh Breach candy waiting to order their grilled sandwich. The aroma that wafts out of the sandwich griller when this Potato Cheese Grilled Sandwich cooks. A chatpata sandwich that is perfect for the desi palate! The best part about this sandwich is that is captures the best of both worlds – tongue-tickling spices and gooey cheese too. This sandwich holds potato slices and cheese spiced up with chaat masala and green chutney. The junglee cheese grilled sandwich recipe sure lives up to its wild name! With a large assortment of juicy and crunchy veggies, teamed up with sweet corn and paneer, this satiating sandwich also has a fabulous flavour thanks to mayonnaise, green chutney and sweet chilli sauce. The cold version of this is served in many Mumbai bakaries. Three layered cheese grilled sandwich is a hit with kids and so it the sweet grilled roadside grilled chocolate sandwich and grilled chocolate cheese sandwich recipe. Grilled Veg Panini recipes. Panini is a type of grilled sandwich, made with breads like baguette, ciabatta and michetta. It is never made with sliced bread, so if you cannot lay your hands on special Panini breads, you can use hot dog rolls instead. The Eggplant and Mozzarella Panini recipe features a mouth-watering combination of eggplant and mozzarella cheese, perked up wisely with a dash of salt and seasonings. Also, the Tomato Basil Mozzarella Panini recipe is another variant with the appetizing taste of molten mozzarella, tangy tomatoes and the aroma of fresh basil. Cream Cheese Veg Panini recipe is a variant that is sure to pamper your palate! The bread is cut horizontally and packed with cream cheese, an assortment of yummy veggies and aromatic herbs. Similarly, the generous use of cheese and butter adds to the richness of the Roasted Bell Pepper and Feta Cheese Panini recipe. Indian Grilled Veg Sandwiches. The Rajma and Cheese Grilled Sandwich is quite easy to make, but absolutely tasty and sumptuous too! The rajma stuffing, mixed with tomatoes, onions and other ingredients, gives this sandwich a Mexican touch, which is quite enthralling. Paneer and Apple Grilled Sandwich recipe is where grated apples and crumbled paneer are combined with green chillies to make an amazing sweet and spicy filling, with a rich texture. Choose fresh apples to make this dish, so that they will retain a bit of their crunch even after grilling. The bland paneer can also be combined with cababge or other veggies like tomatoes and eggplant to make cabbage and paneer grilled sandwich or grilled tomato, eggplant and paneer sandwich. Everyday ingredients brought together in the right way give you a sumptuous sandwich, which is cheesy, juicy and crunchy all at the same time. The vegetable noodle grilled sandwich is a unique snack that will be loved by everyone. Serve the grilled sandwiches with french fries or potato wedges to make a complete meal. Grilled vegetable sandwiches taste amazing with green chutney, homemade tomato ketchup, minty green chutney or red garlic chutney. 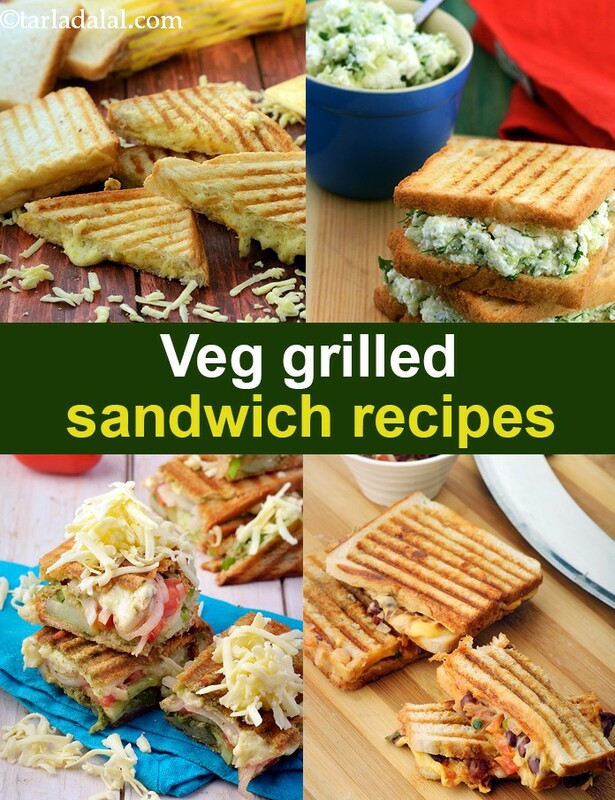 Enjoy our Veg Grilled Sandwich Recipes, Collection of Grilled Sandwiches and other sandwich recipe articles below.